Murshidabad, the city in the western tract of Bengal (known as Rarh), on the bank of Bhagirathi has a glorious past that with time shaped India's history. Its home to many medieval architecture, grand palaces, intricately worked tombs, exquisite gardens and some beautiful handicraft that is treasured by the whole nation. These are facts that are well known to everybody but what nobody knew till date is, The numerous rare, exotic and exquisite varieties of mangoes owned by this land, found no where else but in Murshidabad. The nawab's of Murshidabad were connoisseurs of mangoes and it is said that during the era of Akbar, Murshidabad's orchard had more than 200 varieties of mangoes. Though they are getting extincted day by day still the taste, texture, flavour of Murshidabdi mangoes are unmatched by that from the other parts of India. sustainability and Responsible Luxury.”Us the KFB table members were one of those lucky lots who got a chance to sample some rare flavours of the fruit. Mr. Pradip Chopra, President of MHDS and Chairman of iLead is one of those mango enthusiasts who wants to preserve this art of growing, nurturing and preserving these rare varieties for posterity. With his beautiful presentation he took us back in history and brought another hidden gem of the land in notice, the Sheherwali jain cuisine. Almost 400 years back when new sea routes were discovered for trade, few jain traders and businessmen from Rajasthan came to Murshidabad and settled down in Jiaganj and ajimganj area. Later they came to be known as 'Sheherwali' or city dwellers. With time their style of cooking absorbed local flavours in terms of Bengali and Nawabi Mughlai food and created a distinctive style of their own, called Sheherwali cuisine. These sheherwali ladies have a fine style of peeling, cutting, slicing and aesthetically serving the mango, which ensures no mark on the fruit and no loss of its sweet juice. 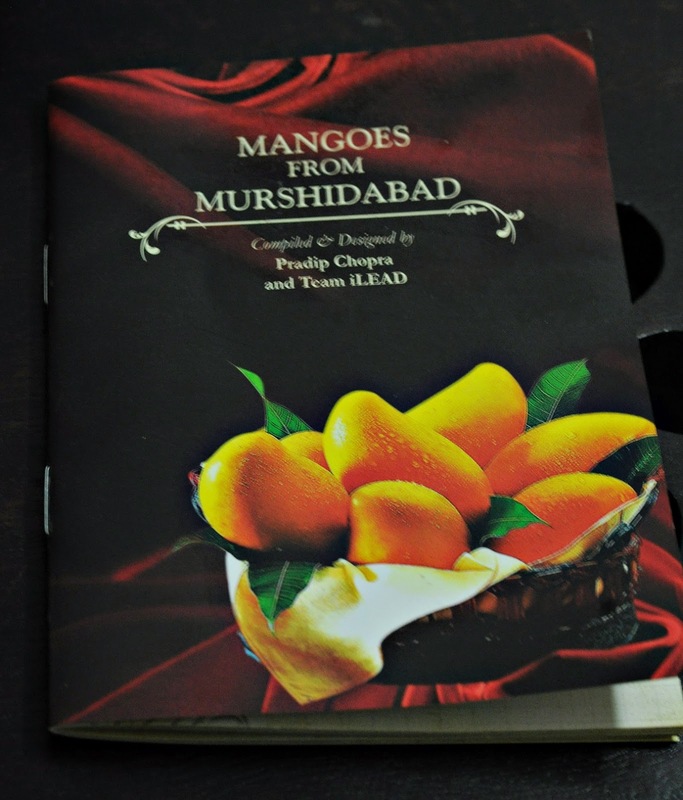 The pocket book compiled by Mr. Chopra and iLead team, beautifully captures the history of Murshidabad's love affair with mangoes, Illustrates the Sheherwali way of cutting the fruit and also shares few Sheherwali mango recipes. MHDS, a non-profit body, is an initiative taken by these Jain families to restore and develop the dying heritage of India, starting with Murshidabad. They also organised the Mango haat last year to showcase the rare varieties with the hope that it will encourage the growers and as a result these almost extinct varieties would be preserved. They also want to highlight the fact that, Though expensive but if care is taken, these extremely delicate and flavourful mangoes can fetch very good price in International market. Luckily for us there were plenty of varieties of mangoes on display and to sample from. There was this extremely delicate Kohitoor placed on thick cotton pads to keep it fresh. For the best taste these mangoes are to be plucked by hand, turned every 12 hours for it to ripen evenly and are cut by a bamboo wedge. With its golden colour, soft and smooth texture and beautiful flavour, no wonder its the famous Nawabi variety. Its a shame that hardly 50-60 trees of this variety is still around. Molamjam, another exclusive variety is prized amongst mango lovers. It is said that Molamjam must be taken off the tree and eaten just the very moment it is ripe, even if its in the middle of the night. Bimli on the other hand is another very juicy and sweet variety. Ranipasand, Kalapahar, Ananas, Bira, Saranga were the other unsung beauties from the region.to make the experience memorable Few Sheherwali ladies were there to demonstrate the art of peeling mangoes with utmost precision and present it to the invitees to taste. 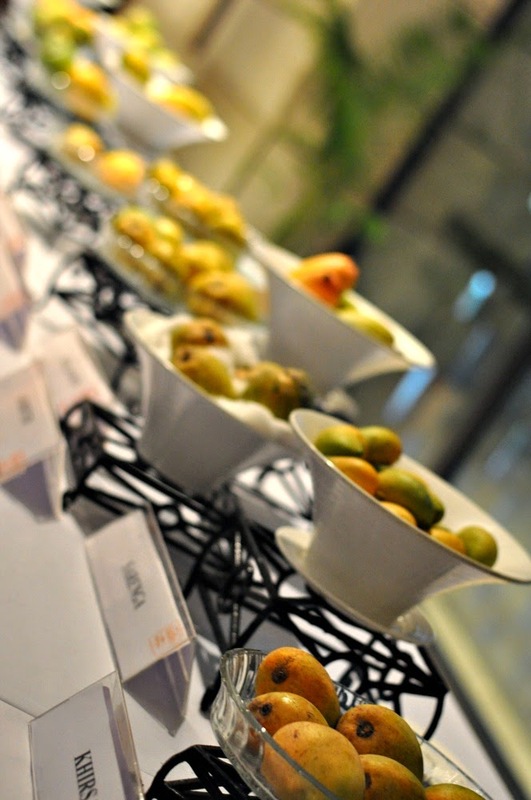 The ITC chefs prepared different types of canapes, cakes and finger foods featuring mangoes. 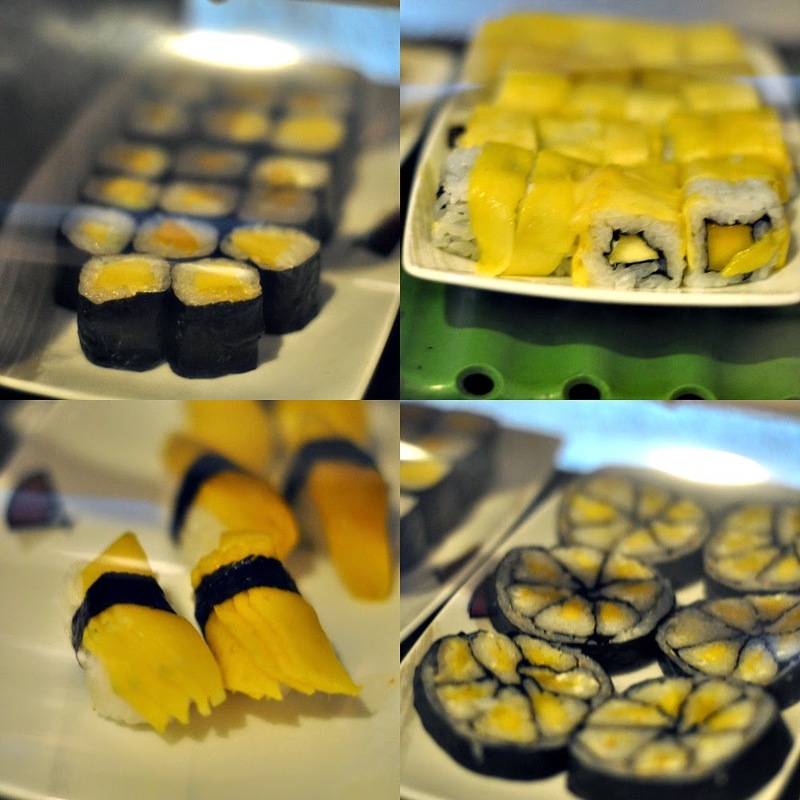 What took the guests by surprise were their effort to prepare Mango maki, an assortment of sushi rolls with sweet juicy mangoes. 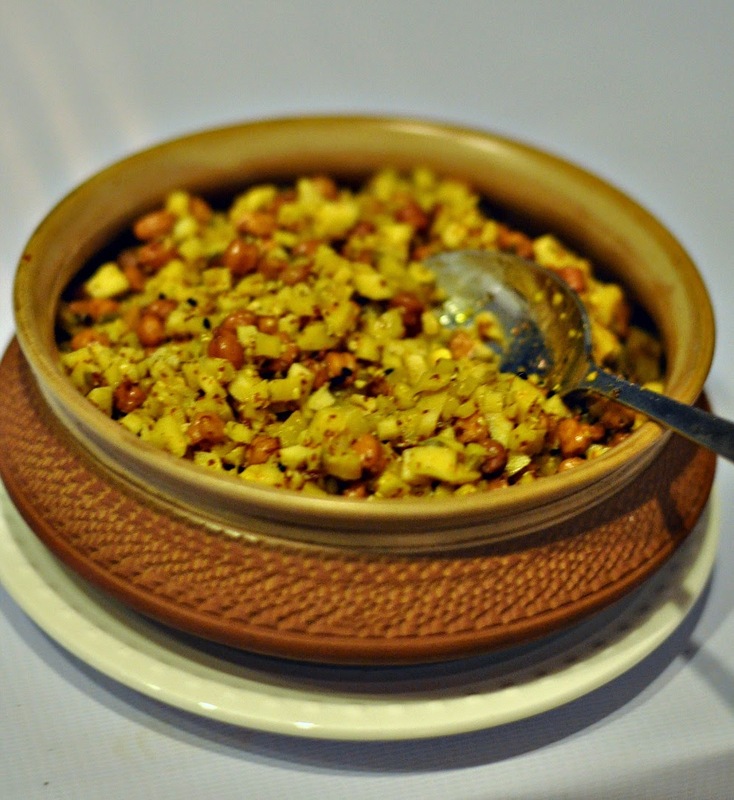 Being a food enthusiast I loved exploring the Sheherwali cuisine. Their most cherished recipe, kachhe aam ki kheer or Raw mango and milk pudding when eaten on a bed of crushed ice, is a delightful treat for the summer months. So is the Kachhe aam chana ka kutti. A raw mango and Black chickpea instant pickle. The tongue tickling chutney, Kachhe aam ki lounji is a versatile accompaniment that can perk of any meal, I loved pairing it with the very flavourful Mathri on offer. It was definitely a beautiful evening well spent knowing more about our heritage and going back to the soil. Fascinating read! You are really lucky to get to experience this heritage and commendable attempt to revive it. The new presentation of the fruit ought appeal to the modern food lovers. Thanks for sharing Sayantani! This is really interesting, Sayantani. Very creative, too. I have never heard of Sheherwali cuisine. In our traditional Andhra mango pickle, we add raw black chickpeas and they get pickled too.